The Oakland A’s are proposing construction of a new ballpark at the waterfront Howard Terminal site, part of a larger initiative that includes redevelopment of the Oakland Coliseum property. The new Howard Terminal ballpark would be a fairly intimate facility, calling for a seating capacity of 34,000. It would be surrounded by a series of high rises, as well as a rooftop public park. In an attempt to offset some access concerns that have long surrounded the industrial Howard Terminal property, the A’s proposal also calls for an aerial gondola that would lift fans over railroad tracks and Interstate 880 from downtown Oakland. For the Howard Terminal property, the A’s are expected to launch a yearlong environmental review process. Building at the site would also require an agreement with the Port of Oakland, the property’s owner, and the team will have to secure either a purchase option or long-term lease by April in order to avoid losing a $100,000 deposit. The Howard Terminal ballpark is one part of a larger proposal that would also see the A’s take control of and redevelop the 111-acre Coliseum site. One of the highlights of that component of the project are plans for the Oakland-Alameda County Coliseum itself, which would be converted into a small sports park/amphitheater (as shown in the rendering above). Surrounding land would be redeveloped to include housing, a tech hub, a youth sports complex, retail, and light manufacturing. In addition, the A’s propose leaving the adjacent Oracle Arena open for concerts, sporting events, and other gatherings. Oracle Arena is currently home to the NBA’s Golden State Warriors, but the Warriors are set to move to a new venue in San Francisco at the start of the 2019-20 season. “This is a big vision for our city,” A’s President Dave Kaval said. The A’s see a downtown ballpark location as the only viable option to excite fans, and generate new ticket sales and revenue needed to make the deal pencil out. The A’s have been searching for years to replace the Coliseum, and this is the most tangible plan to surface a previous proposal to build at a site near Oakland’s Laney College stalled late last year. Still, there will be several hurdles to clear before this proposal can move forward. Along with an environmental review of the Howard Terminal site, the A’s will also need to gain control of that land and bring a successful conclusion to negotiations for the Coliseum property. While it is anticipated that the new ballpark itself will be privately financed, the project is expected to call for public funding for infrastructure upgrades at both Howard Terminal and Coliseum sites, but the exact public contribution is unknown at this point. 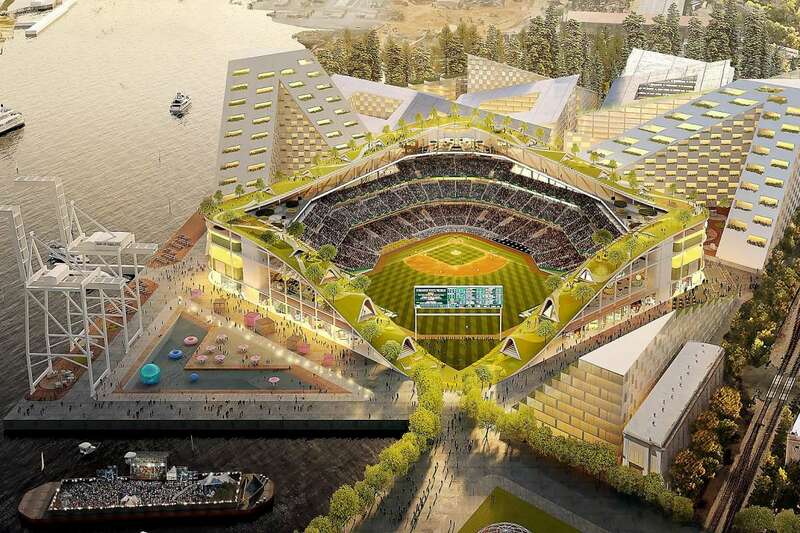 Renderings courtesy Bjarke Ingels Group / Oakland A’s.